A 3kW solar system was once the most popular sized residential solar system in the country, and will still suit many people. You can pick up a good 3kW system, installed for about $3,700-$4000 (June 2018). 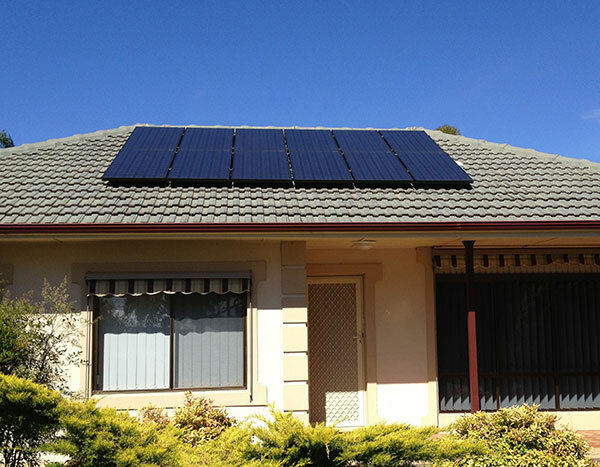 For an average Aussie home, a 3kW solar system will generate the equivalent of about two thirds of total electricity usage. But be warned; if you have ducted air-con, a pool pump and a home automation system in your big ol’ house then it’s not going to make much of a dent in your electricity bills! 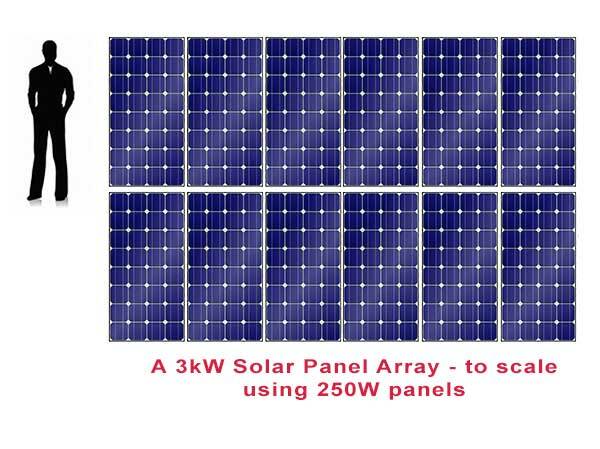 To make up a 3kW solar system you need 12 solar panels, assuming that you use 250W panels. Each panel will be about 1.6m x 1m, so you’ll need at least 20m2 of roof space. How much electricity will a 3kW solar system generate? A 3kW solar power system will generate approximately 12 units of electricity (called kilowatt-hours or kWh‘s) per day. As mentioned, this is about 2/3 of the electricity usage of a modest Australian home. How much cash will a 3kW solar system earn? 2) How much much electricity you use. In fact, (1) is usually a bigger factor than (2). Why? Because the timing determines how much of your precious solar energy goes out into the grid instead of into your home. This matters because most states in Australia pay about 8c per kWh for exported electricity. Compare that with the 30c per kWh most folks pay to buy electricity from the grid. This means that using your solar electricity energy in your home saves you 30c per kWh, whereas exporting earns you only 8c per kWh. A 350% difference! Scenario 1) You use all your solar electricity in your home. This is unlikely unless your home is full of huge energy guzzlers (e.g. ducted air con and/or big pool pumps) that run all day, every day. But in this scenario you would save 30c per kWh for every last drop of solar energy you produce, which equates to approximately $1500 in the first year and about $45,000 over 20 years assuming electricity inflation of 5%. Scenario 3) You use no power in your home when the sun is shining (unlikely). In this scenario, you export all your solar electricity. In this case, you would save about $400 in the first year, and about $7,000 over 20 years. As you can see, solar can give a great return in Scenario 1 and 2, but is pretty marginal in Scenario 3. So it is important to get quotes from installers who can estimate your export percentage. If you are intrigued by the whole import/export thing, then you can read about the relationship between exports and payback here. You can see the payback and cash-flow numbers for yourself with my solar payback calculator. How much will a 3kW solar system cost? How long before a 3kW solar power system pays for itself? If you are not exporting any energy then it will pay back in less than 3 years, assuming you pay 30c per kWh for imported electricity. The more energy you export the longer that stretches out. But the great thing about solar (that can be lost in a simple payback calculation) is this: The monthly cash flows to get yourpayback can be positive, for many people (depending on how you pay for the system). This means that there is a good chance that – from the first month – your savings will be greater than the cost of financing the system (or if you are paying cash your savings will be more than the interest you would have earned from the $4,000 sitting in the bank). So I hope I don’t come across as a slimy salesman by pointing out that you may be leaving cash on the table every month you don’t have solar on your roof. 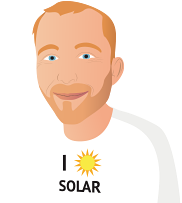 Again – this all depends on your individual situation – so if you are keen to explore reducing your overheads with solar energy, I recommend getting 3 quotes from hand-picked, local installers who can work out if solar makes financial sense for you or not.